With 1800 acres of land, 300 species and more than 3,000 animals, the San Diego Zoo Safari Park is one of San Diego’s best attractions for all ages. In addition to viewing an enormous variety of Asian, African and other animals, visitors can participate in safaris ranging from trams to zip lines that bring them even closer to the animals. It’s also important to note that the park, as part of San Diego Zoo Global, is a nonprofit organization dedicated to playing an instrumental role in helping to bring 130 species back from the edge of extinction. In this guide, we’ll tell you everything you’ll need to know about visiting this special place including an overview of the animals, what to bring, how to buy tickets and much more. Click to Save $10 off 1-Day adult tickets. San Diego Zoo and San Diego Safari Park in One Day? Formerly the San Diego Wild Animal Park, the park was opened in 1972 as a breeding facility with species conservation in mind for animals at the San Diego Zoo. While the zoo has used more natural forms of containment like moats and sloped landscapes since opening in 1916, this park would be an even more open habitat for the animals where they could have the space to live freely. Visitors would be the ones “contained” as they moved through the park on a monorail. Over time, the park has changed and grown. They now have an extensive selection of enclosed exhibits in addition to the original free-range enclosures (the monorail has become a tram that circles the area) and unique guest experiences. San Diego weather is fairly even all year round. The San Diego Zoo Safari Park is more inland, so it tends to get hotter and colder than areas nearer the coast. It’s a good idea to come early in the day during the summer. Most of the shows are in the morning, and that’s one of the times when the animals will be most active. Temperatures can reach the high 80s (and on some days well into the 90s) in summer. The cooler months are a great time to visit since there are fewer people and a greater chance of rain. Don’t let the chance of rain discourage you. Elephants and rhinos in particular love to roll around in the mud, for example. Many animals give birth in the spring, so this may be a good time to see some adorable babies. 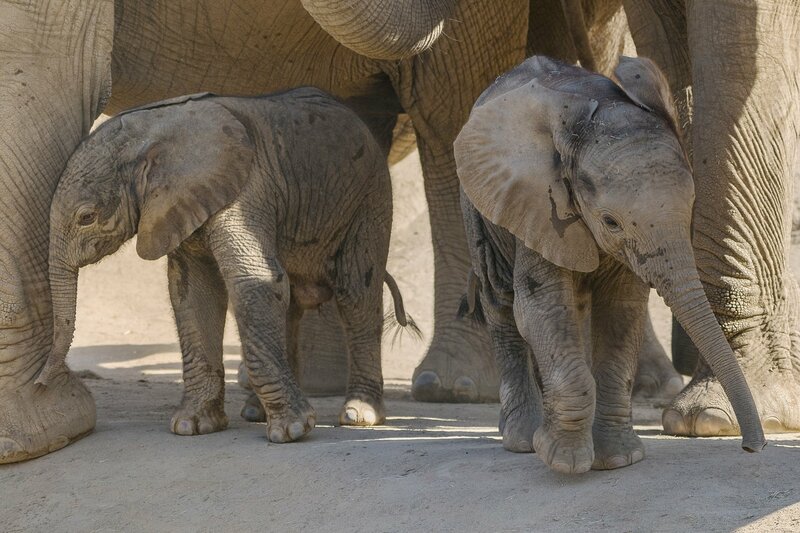 An almost two-day-old female elephant calf (left) and a 7-week-old male elephant calf (right) met for the first time this on September 28, 2018, at the San Diego Zoo Safari Park. The adults were rescued in 2003 from the Kingdom of Swaziland, where they faced being culled. While the park is open for every holiday, the best time to go is definitely during a non-holiday weekday. You’ll see about a third of the people you’d see on the weekends. While you could probably see all the exhibits (and maybe squeeze in a shorter safari) in about 4 hours, I’d plan to spend the day here if you want to get the most out of your experience. There’s a lot to see and do. Take a look at the map with your group before you go to prioritize what you’d like to see. Reserve a safari (more details about each below). Take a look at special dining events (some provide entry to the park an hour before it opens). Get excited by watching the animal cams. It’s best to start your visit at the top of the park and work your way down since it gets hotter as the day goes on. Most of the shade is in the areas closest to the entrance. The most important thing to note, especially during the summer, is that the animals will be most active when it’s not hot. Try to visit attractions earlier in the morning or later in the afternoon, avoiding right at midday. For example, I would head to Walkabout Australia — where you can experience the kangaroos, and other animals come up to you — at opening or around 4 p.m.
Also keep in mind that while it’s less hilly than the San Diego Zoo, you’re still going to be doing quite a bit of walking if you want to see the whole park. These are big animals in big exhibits, so it takes longer to walk between them. Complimentary carts pick up and drop off visitors at designated locations. The only other free transportation is the tram that travels around the African Plains. You may also rent strollers, wheelchairs and electric scooters. There are water fountains throughout the park, and any of the restaurants will refill a reusable bottle with filtered water. It’s understandable that visitors to San Diego would want to fit attractions as possible into their time here, but I don’t recommend that anyone try to see both the San Diego Zoo and the San Diego Zoo Safari Park in one day. 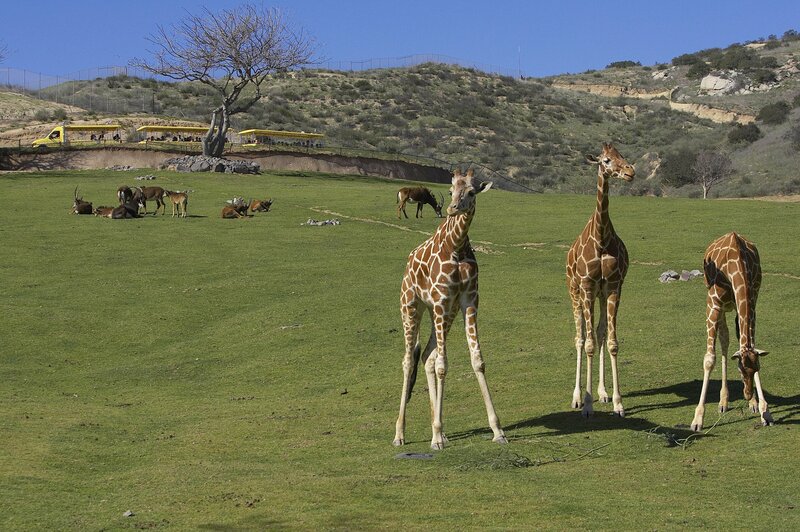 Besides being 40 minutes away (35 miles) from the San Diego Zoo, the Safari Park is a daylong venture on its own. You won’t get nearly as much out of either experience by seeing both on the same day as you would by visiting each separately. And, it will be A LOT of walking. The other thing to consider is that the I-15 freeway between the two attractions can be quite trafficky during the weekday work commute. 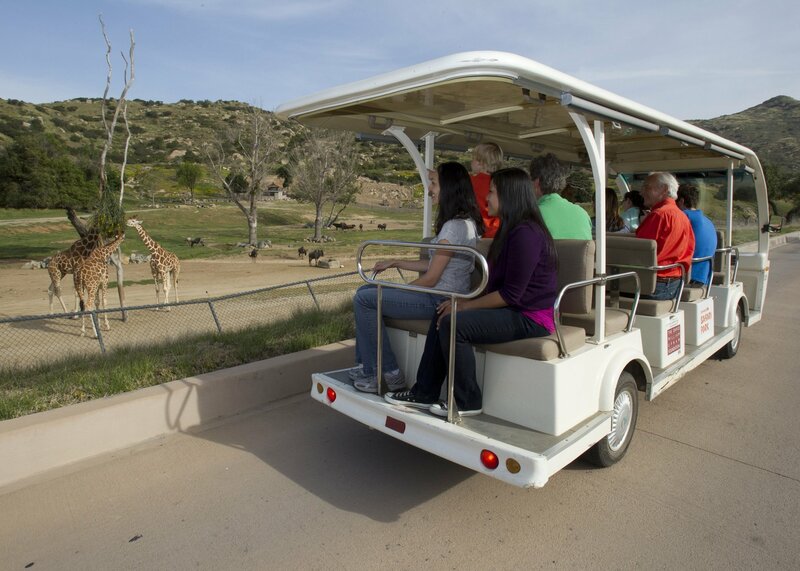 On most days San Diego Zoo Safari Park hours are from 9 a.m. – 5 p.m. (check the calendar). For those who are keen to power-sightsee, it is far more realistic to see San Diego Zoo and Balboa Park on the same day as they’re right next door to each other. While there quite a few optional safaris, the Caravan Safari is one of the most popular paid activities at the park. It’s the only standard safari where you get to visit multiple animal enclosures and interact with them up-close. Unusual animals such as Cape buffalo, wildebeest, and East African crowned cranes can be seen in detail without the aid of binoculars. 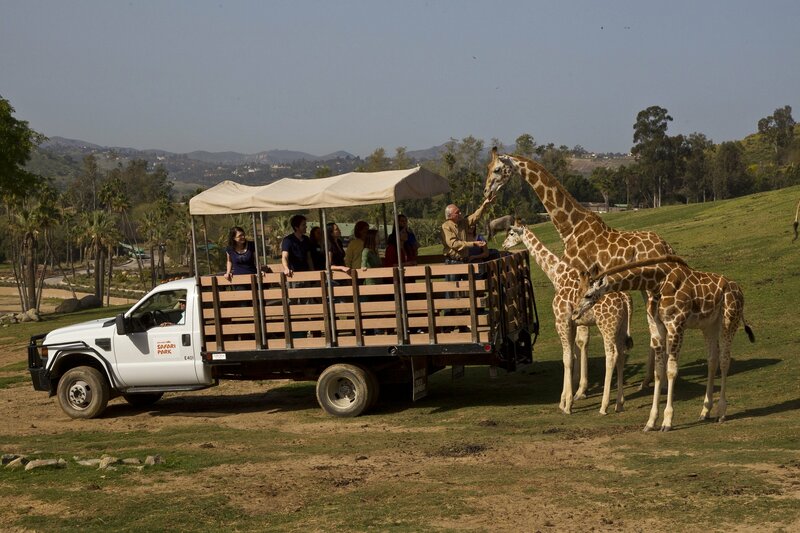 You’ll take a safari truck through at least two of the free-range areas to see Asian and African animals. The best part: you’ll have the chance to feed the giraffes and rhinos! There are four different versions of the safari to choose from. All of them except the Caravan Safari Kids are for visitors ages 8 and up, and any kids younger than a paid adult must accompany kids 15 years old and younger. Note: selfie sticks are not allowed on any of the caravan safaris. The most basic version of the safari, but still very fun. Time: 2 hours. This safari takes place later in the day, so you can take advantage of the cooler temperatures and see more animal activity. It’s only available during select months, so make sure to check ahead of time. Time: 2 hours. If you want to spend the most time possible with the animals, you’ll see on this safari, go with this version. Since it’s up to the animals’ discretion whether or not they come up to you (even if they’re lured with treats), this will give you a much better chance at interacting with them. Time: 3.5 hours. This Caravan Safari was created specifically for children and is open to visitors ages 6 and up. It’s a more educational safari: it includes a presentation by the guide, hands-on activities, and meetings with “animal ambassadors” in addition to a trip to see the African animals in their enclosure. Time: 2 Hours. If you’re looking for something a little different from the Caravan Safari, there are still plenty of other worthwhile options. The safaris, minus the tram, do cost extra in addition to your entrance ticket; but they’re a fantastic opportunity to experience the park in a way you wouldn’t otherwise. It’s a good idea to book in advance since they all fill up quickly and tickets are cheaper online than at the park. The Africa Tram is the only safari included with your entrance ticket. 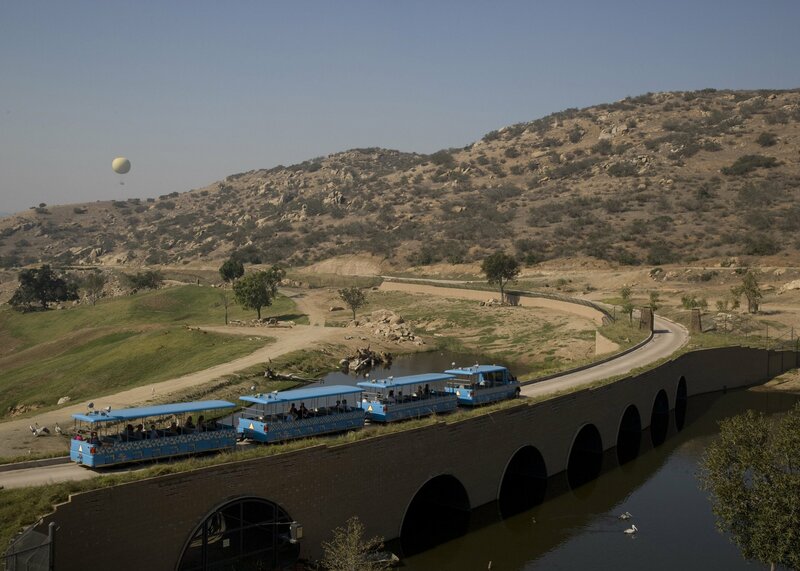 Departing out of the African Outpost, the tram travels 2.5 miles around African Plains and gives you a look at the animals that reside in the field enclosures such as white rhinoceroses, giraffes, Cape buffalo, Roosevelt’s gazelles, African crowned cranes and more. You can go on the soft-wheeled, biodiesel tram as many times as you’d like. It doesn’t open until 10 a.m., so if you come at opening don’t worry about rushing over to be the first passenger. The lines can get very long on busy days. 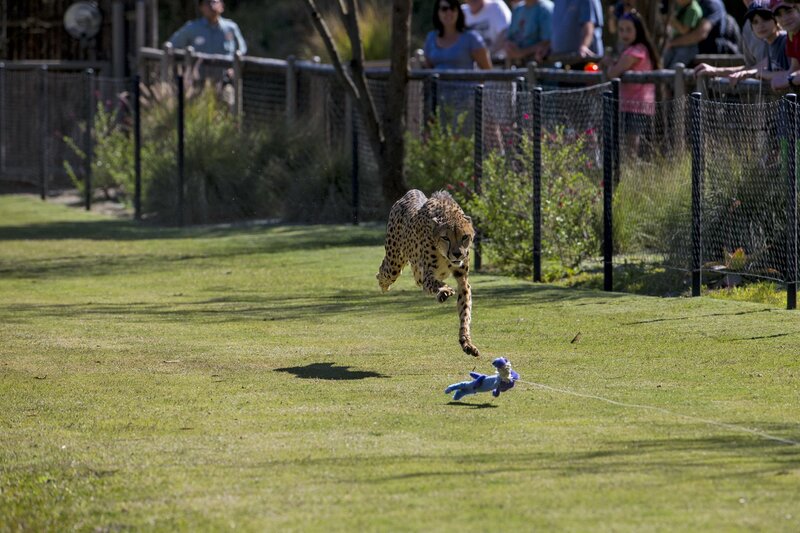 However, if you go at 3:30 p.m., during the Cheetah Run, you’ll have it almost all to yourself. Time: 45 minutes; open to all ages. 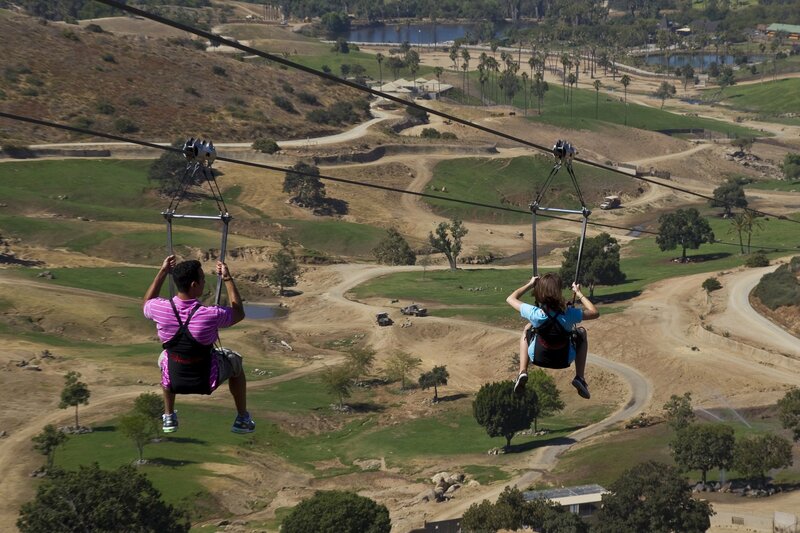 This safari gives you a chance to get a bird’s-eye view of the park and surrounding countryside of Escondido. Hop into a hot-air balloon that takes you 400 feet in the air and catch some unbelievable views. 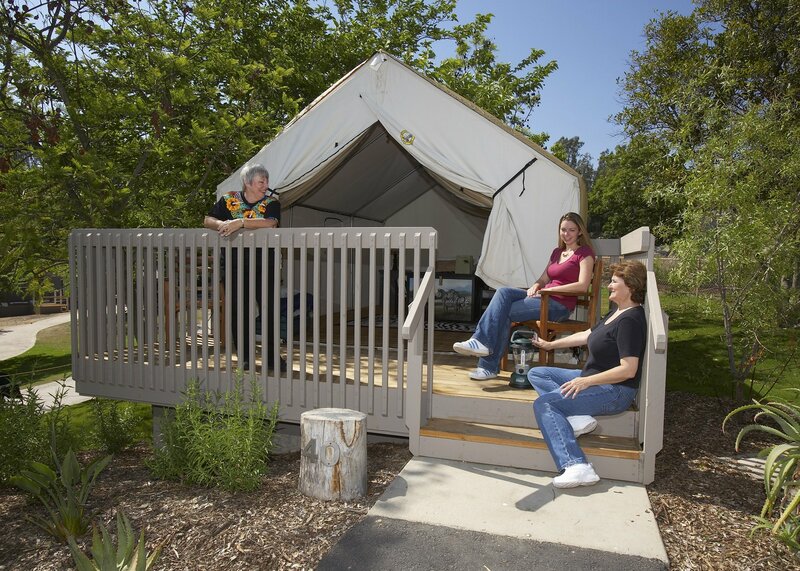 Prices vary, and reservations aren’t available online, so ask when you arrive at the park. Time: 12 minutes; open to all ages. This safari lets you get an inside look and learn about one animal exhibit of your choice (elephants, kangaroos, rhinos, tigers, lions, cheetahs, or the animal care center). You’ll explore keeper-only areas to find out more about the animals and what it’s like to care for them. If you pick the Veterinary Medical Center option, you’ll get an in-depth look at how sick or injured animals are looked after in this top-of-the-line animal hospital. All the options are for ages 3 and up, except for the Rhino Rescue and Veterinary Medical Center, which is for ages 6 and up. Time: 2 hours. The Cart Safari will take you around one of two enclosures, depending on whether you choose the African or Asian option. Besides saving you time walking between the exhibits, this is a more personalized experience — it’s up to you what you want to learn as you’re led by a tour guide who is there to answer every question you could have. There are plenty of stops for photos, too. Guests also have an opportunity to offer a treat to wildlife in the field enclosure! This is an excellent safari for anyone with very young children or even babies, as children younger than 2 years are allowed to join as long they remain on their parent’s lap. Time: 1 hour. 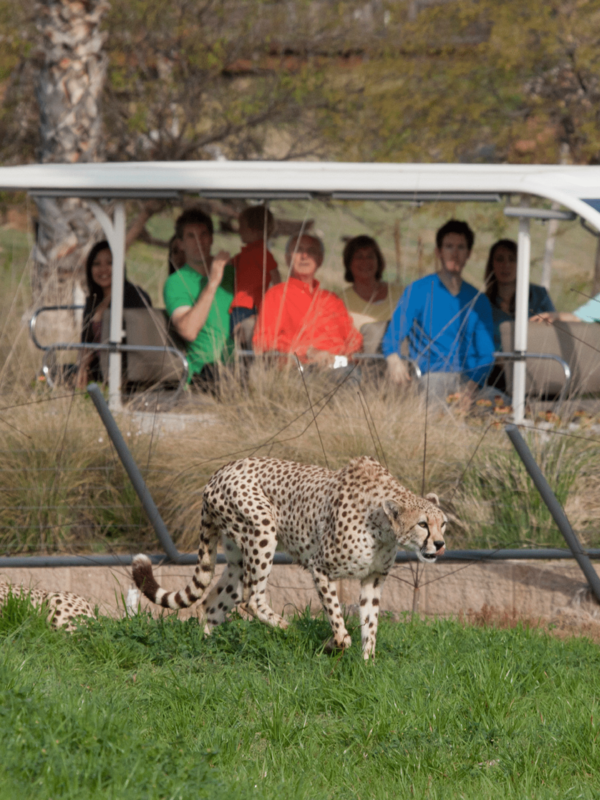 Get reserved seating for the Cheetah Run that ensures a great view, a private close-up with an additional animal ambassador before the show, and even a meet-and-greet with Shiley the Cheetah afterward. 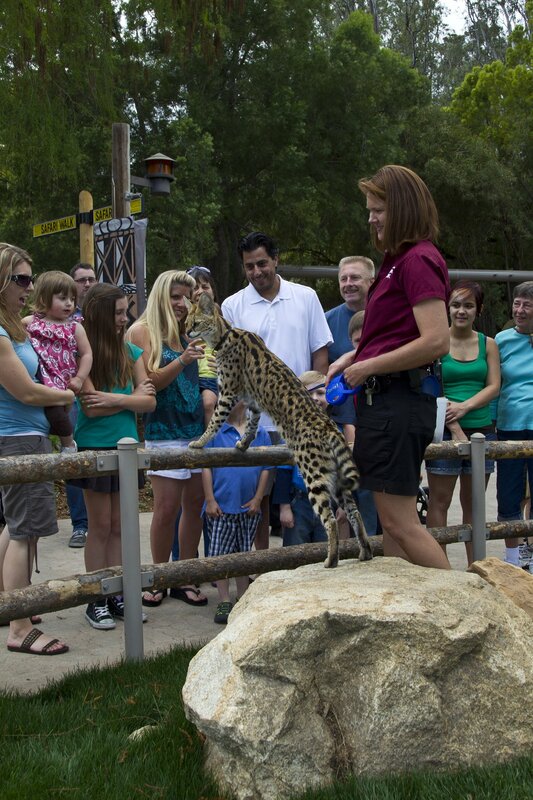 The Cheetah Safari is open to visitors ages 10 and up. Time: 1 hour, including the Cheetah Run. If you couldn’t tell from the name, the 2/3-mile-long Flightline Safari is an excellent choice for any thrill-seekers. You can fly over the park via a secure zip line that will give you a fantastic view of the park from up to 130 feet in the air. You’ll fly like a condor over rare and endangered species including the Arabian oryx, greater one-horned rhino, Pere’ David’s deer and Przewalski’s wild horse. If you’re inexperienced, don’t worry. Not only will the able staff give you a thorough orientation before your ride, but you’ll also have the chance to do a practice run on a mini-zipline first to get your bearings. You can even have your journey recorded with a camera on your helmet for an extra fee. Make sure to wear closed-toed shoes and refrain from any alcohol before this safari, or else you won’t be allowed to join. The Flightline Safari is only open to ages 8 and up, and there’s a maximum of 3 children between the ages of 8–15 for every one adult. The minimum weight is 60 pounds, so make sure that your child meets that in addition to the age requirements. You will also be required to sign a liability waiver. Children ages 16-17 can ride the zip line on their own if they have a legal adult over the age of 18 sign the liability waiver for them at check-in. Time: 1 Hour, including training. If ziplining sounds like a bit much for you or your companions, but you still want an active adventure, check out the Jungle Ropes Safari. You’ll get your adrenaline rush while sticking closer to the ground. You’ll be able to choose one of three elevated courses to explore, each containing a different combination of obstacles to cross, like rope bridges and swinging platforms. You’ll receive your safety harness and full instructions from the staff, who will be there with you during the length of the course if anyone in the party needs assistance. The Jungle Ropes Safari is open to ages 7 and up. There is a maximum of two children ages 7–11 for every one adult. As with the Flightline Safari, you’ll be required to sign a waiver. Children ages 12–17 may go through the course alone if they have a legal adult sign the waiver for them at check-in. 90 minutes, including training. This safari gives you the unique opportunity to sleep over – inside the park! There are four different options, and the activities will depend on which one you choose. However, all of them include after-hours access to the animals in the park, guided tours, dinner/breakfast/snacks, and of course, a campfire, not to mention a unique wake-up roar from the lions. This is the best choice for families, especially those with young children (ages 3 and up). You’ll ride around the park on the Africa Tram and personalize your experience with one of several guided walks. For ages 21 and up. This safari includes hikes that might be a little much for young ones, along with some topics that are suitable for older age groups (one Valentine’s Day topic covers the mating habits of the animals). You’ll also get more personal encounters with the animal ambassadors. For ages 5 and up, this Safari focuses on educating your troop about the animals in the park through guided walks, activities, and crafts in addition to the standard Roar and Snore Amenities. This safari for children who are in the 3rd, 4th, or 5th grades is a field trip kids won’t soon forget. Your class will get a hands-on lesson all about both the animals and current preservation efforts in the wild. It’s an excellent way for children to have a ton of fun while continuing to learn outside the classroom. As the name indicates, this is by far the most inclusive and full-access safari. It’s super personalized: you get to craft your own experience depending on what you want to do at the park. Want to do the course from the Jungles Ropes Safari and get reserved seating at the Cheetah Run? Feed giraffes in the caravan safari and still get to tour the animal care center? Get even more behind-the-scenes access to the animal exhibits? This is the safari for you. While 5 hours is the default runtime, you can spend up to 8 hours on this tailored-to-you experience. 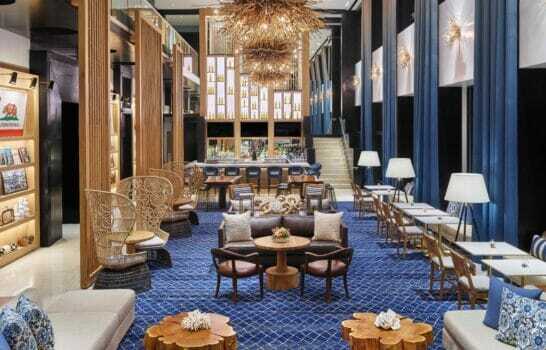 At the time of this writing, the cost is $690 per person. Age minimums will depend on which activities you decide to include in your experience. What makes this park so unique is first and foremost its massive collection of exotic animals. From perennial favorites like elephants to species you haven’t even heard of before, there are what seem like endless exhibits to visit. You can visit daily shows to see them in action, but there are also plenty of chances to interact with the animals, too. The newest addition to the park, Walkabout Australia is one of the most up-close-and-personal exhibits. You can walk along a path through the home of several of the most exciting mammals and birds from down under, including wallabies, cassowaries, and two kinds of kangaroos. If you’re lucky, they’ll come over and greet you. There’s also a lovely bonsai garden and lagoon. The Lemur Walk is another exhibit that allows you to walk uninhibited through the habitat of some cute little creatures. While visitors are asked not to touch the animals, they can come up to and interact with you – and often do! They’re very curious, so sometimes they’ll even venture close enough to sniff you. Lemur Walk is for visitors ages 5 and up. Lorikeets are some of the most stunning, not to mention adorable, birds you’ll ever see. Another interactive exhibit, Lorikeet Landing lets you meet them and physically interact with them. You can buy a small cup of their favorite treat, sweet nectar, to coax them over. You’ll more than likely make several new friends who have no problem perching on your outstretched arm. This is the only exhibit where you can actively go up to the animals to pet and groom them. The Petting Kraal, filled with adorable goats, is an excellent stop for young children or anyone who wants unlimited animal time. Just make sure not to bring in your maps or papers – the goats are known for tricking visitors into letting their guards down and then making a quick snack out of their belongings. 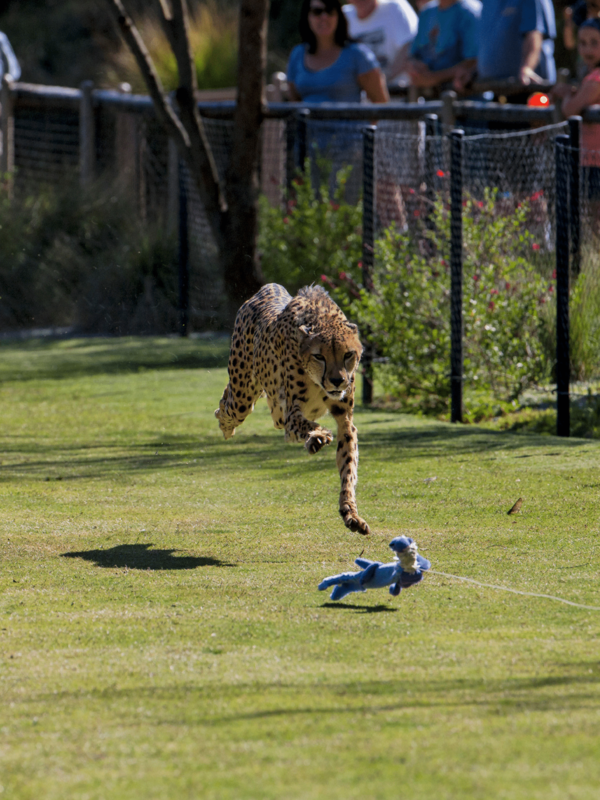 The Cheetah Run is one of the most popular shows at the park. You’ll watch the star of the show, Shiley, show off her running skills by sprinting along a track at breakneck speeds of up to 70 miles an hour in less than 4 seconds. It’s an impressive feat. You can even feel her running by if you sit close enough. Time: 3 p.m. at the Lion Camp. Watch some of the most powerful birds around take flight right over your head. Frequent Flyers is another very popular activity that’ll keep all ages entertained: trainers will teach you about the birds and just what makes them so unique. If you want to know how these birds are trained for free-flight, come a little earlier to join in on a Training Talk from one of the experts. Times: 12 p.m. and 2 p.m. at the Benbough Amphitheatre (AKA the Bird Show Amphitheatre); Training Talks are held at 10:30 a.m.
Times: 9:30 a.m. and 2:30 p.m. at the Safari Base Camp, but there are additional showings at the Okavango Outpost (African Outpost) at 11:30 a.m. and 2 p.m. and near the Benbough Amphitheatre at 12:30 p.m. These big friendly giants are a cant-miss. Their habitat includes both an open area and some caves where they can get relief from the heat, so they might be a little hard to spot at first. If you’re quiet enough, they’ll come out so you can see them. The best time to see the gorillas is between 12 p.m. and 1 p.m. when the giant bag of food is dropped down into the area by the keepers. Gorillas love to eat, so they’re guaranteed to be out and about. Make sure to visit by 4:30, since the animals are taken off the exhibit around 4:45 p.m.
What zoo would be complete without elephants? This is a particularly special exhibit, too; it’s home to a baby elephant, Zuli, who was born on International Elephant Day. If you want to see something cool, check in with the staff when you arrive to find out what time feeding is planned for. With the elephants in one yard, the keepers put their meal in another and open the gates. The result is that you can watch all of the elephants make a run for their lunch. It’s incredibly rare to see a Sumatran tiger out in the wild, especially now with the rise in poaching that has put them on the endangered species list. Like most of the animals, it’s best to see them early in the morning or later in the evening so that they’ll be more active. 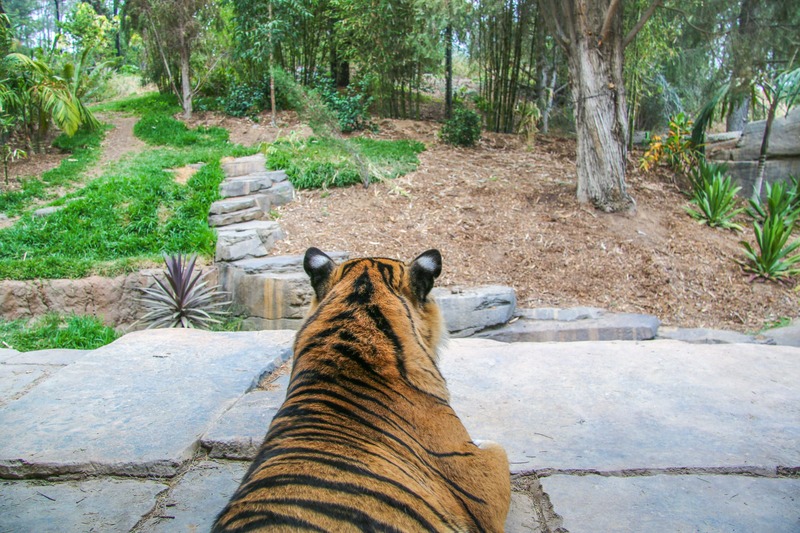 However, if you walk down the stairs to a little dip right next to the exhibit, you’ll see up-close one of the tigers who likes to hang out there for most of the day. If you have time, definitely check out the Tiger Keeper Talk that’s held on the Tiger Trail to learn more about these beautiful big cats. A little playground for kids is also located here. 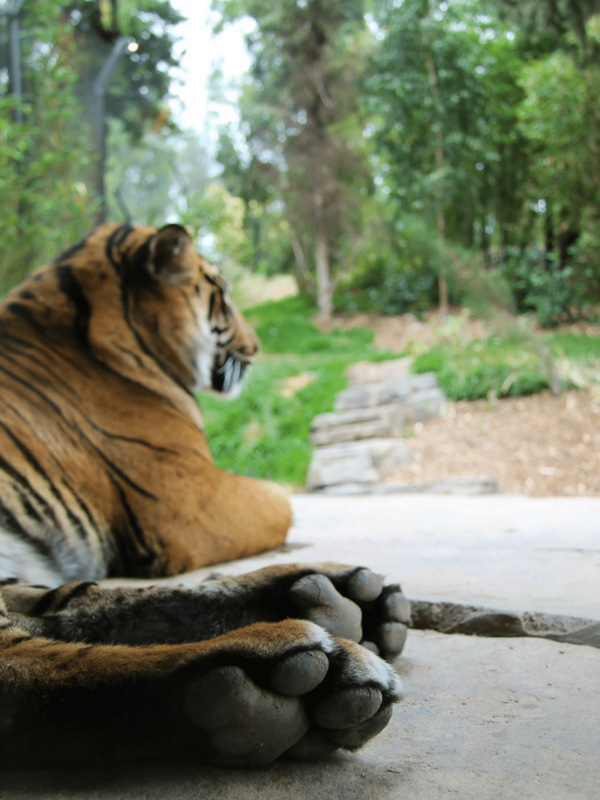 Every once in a while, the San Diego Zoo Safari Park hosts Breakfast with Tigers that allows guests to enter the park an hour before it opens for an exclusive look and learning experience with the tiger keepers. Check the dining event calendar. 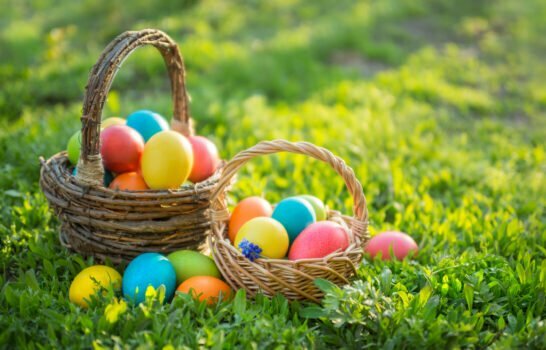 While this isn’t strictly an animal exhibit – it’s more of a garden – it’s still a chance for some cool animal interactions if you know when to go. During the spring this beautiful landscape of jungle foliage is filled with newborn butterflies. It’s a sight to behold, and you might even be graced by one landing on you! The Conservation Carousel, just inside the entrance to the park, and lets you choose from 60 endangered species to “ride.” It’s a lot of fun and always a big hit with young kids. For $6, you get unlimited rides from 10 a.m. to closing. There are play areas all over the park with different jungle themes. They’re a good place to take a break while any younger visitors get some extra energy out. There are also splash pads throughout the park, so it’s a good idea to bring swimsuits for the kids. There are plenty of places to eat in the park. All of them are small casual restaurants or kiosks, but some have covered seating. Some of them have gluten-free or vegetarian options, and pretty much all locations offer different kinds of beer, wine, and other drinks. The Watering Hole at Kijamii Overlook (top pick) offers fantastic views of the animals wandering the African Plains, along with sandwiches, salads, and a full bar. It’s technically open-air since there are no walls, just the overhead cover. Okavango Outpost is also located in the African Plains but has a more extensive menu including with new additions (like artisan sandwiches) to some of the basic favorites (like the chicken strips). 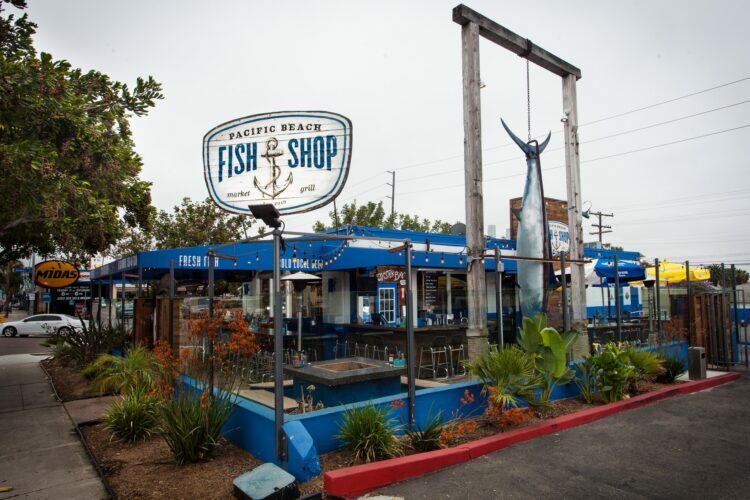 There’s both indoor and outdoor seating. The Sheared Sheep is the newest eatery and is located in Walkabout Australia. It’s best for simple wraps and sandwiches, but you can grab a signature grilled sausage if that’s what you’re craving. There’s plenty of indoor seating and can fit a good amount of people. Mombasa Cooker, in Nairobi Village, has everything from pasta and burgers to Asian bowls and entree salads. They also have vegetarian, gluten-free, and kids meals. It’s a good stop for groups and families with young children. There is overhead cover and a soothing nearby waterfall. Samburu Terrace in the African Woods serves fast and fresh Mexican options, along with burgers, kid’s meals, and gluten-free/vegetarian options. Covered outdoor seating. Thorntree Terrace is located in the Safari Base Camp and is the only restaurant that offers breakfast foods in addition to the rest of their daytime menu. Covered outdoor seating. If you’re getting to the park early in the morning, you can get a much-needed caffeine boost at the Safari Coffee Outpost. Don’t forget to grab a warm mini-Donut. The Oasis Deli has a good selection of snacks and drinks, not to mention the freshly-made fudge. Get your sugar fix by grabbing some soft-serve at Kibo Cones and Snacks or a DIY slushie at Lion Camp Slush and Snacks. They have churros, too. Bamburi Boat Bar is a fun spot to unwind with specialty cocktails, craft brew, and small plates. You can also bring your food with you. This is a good option for groups since buying meals can get pricey. The park’s food policy is that you’re allowed to take in snacks and refreshments, as long as they’re not in a cooler. There are picnic tables throughout the park as well. As mentioned earlier, San Diego Zoo and San Diego Zoo Safari Park are both dedicated to ending extinction which is part of the reason why it’s easy to advocate visiting these parks. Since poaching on the rise, the park also works with San Diego Zoo Global to protect and breed animals that aren’t safe in their native environments, most notably 11 elephants saved from execution by a zoo in Swaziland. The Nikita Kahn Rhino Rescue Center houses six rescued rhinos. Their cutting-edge white rhino surrogacy program is the only program of its kind and the best chance to bring the species back from the edge of extinction (there are now only two left). 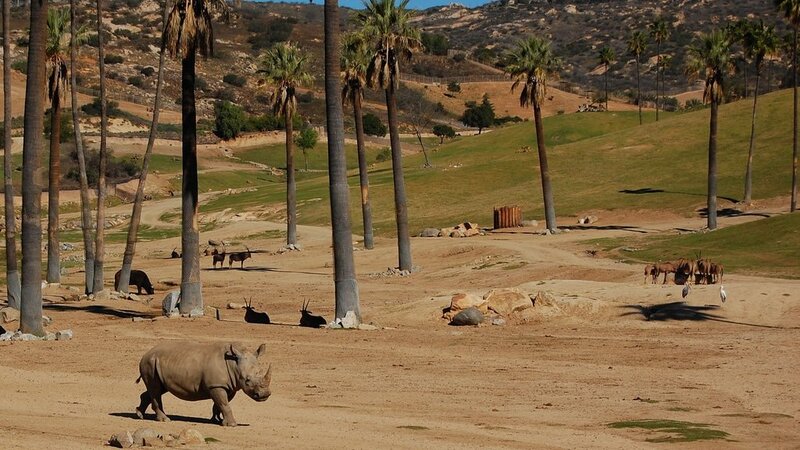 These are just a few examples of the San Diego Zoo Safari Park conservation efforts. The San Diego Zoo Safari Park also played an instrumental role in the comeback of the California condor. And, there is a lot more to say about how San Diego Zoo Global helps animals worldwide. Another fun fact is that animals are treated at the Paul Harter Veterinary Medical Center, which is the largest in the world. I have written in great detail about how to buy discounted San Diego Zoo Safari Park tickets, but here is the bottom line. 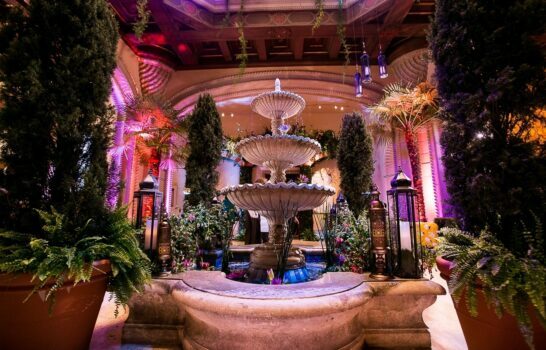 If visiting multiple San Diego attractions, the Go San Diego Card is usually your best bet. Build your own pass or choose an all-inclusive pass good for 1, 2, 3, 5, or 7, days. 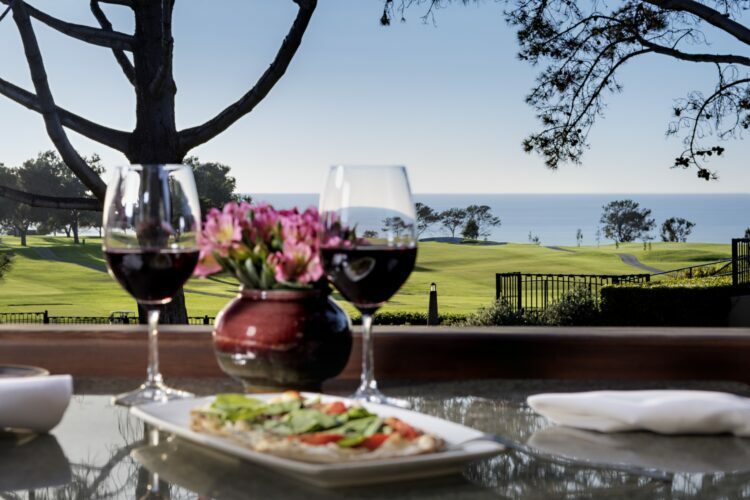 Click to activate your 10% discount on all-inclusive Go San Diego Card passes. Spring break exclusive: Save $10 on adult San Diego Zoo Safari Park Tickets for a limited time only. One of the most popular tickets I sell through this site is the San Diego Zoo Safari Park Family Pack offered by aRes Travel. Buy at least three adult tickets for $47 per ticket (plus $2 per ticket service fee). Child tickets are $39 (plus $2 service fee) which is also a few dollars lower than standard admission. They also can save you about $5 per 1-day ticket after the $2 service fee, and they also have a handful of discounted safari experiences: Caravan Safari, Caravan Deluxe Safari, and Flightline Safari. aRes Travel also sells a variety of combo deals that can be helpful if visiting LEGOLAND, SeaWorld San Diego, and/or San Diego Zoo during your vacation. Safaris, other than the three mentioned above, can usually only be purchased directly through San Diego Zoo Safari Park. It is very wise to do this in advance of your visit to avoid risking your safari of choice selling out. San Diego Zoo Safari Park hours: 9 a.m. to 5 p.m., every day of the year. Parking: At the time of this writing, parking for standard automobiles is $15, and $20 for RVs/Campers. Preferred parking, available on weekends or holidays, is an extra $18 in addition to the regular fee. Age Restrictions: While all ages are welcome in the park, there are some activities with an age minimum, the safaris in particular. All safaris require children 15 and younger to be accompanied by a paid adult, but additional requirements vary with each safari; so make sure to check terms and conditions if you’re planning on bringing young children. When you enter the park, check in with a volunteer or a staff member to see what’s new. Sometimes animals have been moved, and sometimes there’s even a new baby animal that you can see. Don’t be afraid to ask for help or directions. The staff is very passionate and friendly. They’re happy to point you the right way. With such a big park, it’ll be nice to have a helping hand. We love it and hope you will, too.